Pre heat oven to 200 degrees C Fan Forced. Peel and cut the sweet potatoes lengthways into slices around 1.5 cm thick. Cut each slice into long strips around 1.5cm thick to form French fries. Toss the sweet potato fries in the oil then in the polenta to lightly coat the outside. Lay the fries onto a large baking tray lined with baking paper, ensuring there is space between them. Bake for 25 mins or until browned, softened and slightly crunchy on the outside. To make the salt, combine the salt flakes, lime zest and chilli flakes. 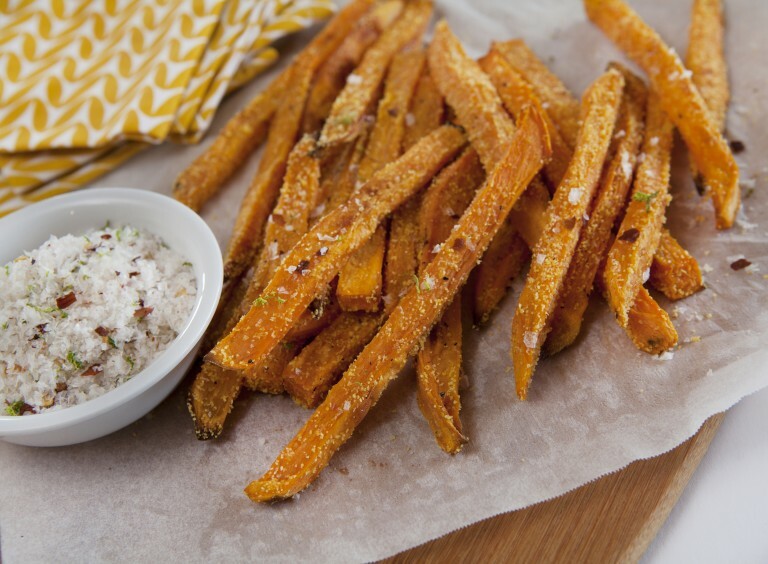 Serve Sweet Potato Fries immediately sprinkled with Chill Lime Salt if desired. Kitchen Notes: *recipe can be doubled if desire and cooked on two baking trays.